In the dead of winter, avid anglers can think of little else beside ice out and the first opportunity of the year to fish open water. Even before the ice melts, many species are also in the mood for a change of pace. Spring spawners like walleye and pike are staging near spawning grounds weeks before the ice melts. Even fall spawners like lake trout and brook trout, sense that the sheets of ice are about to melt and better foraging opportunities are on the horizon. As an angler who views ice out like a kid views the coming of Christmas, I can say with conviction that I will be ready to target all my favorite fish species when the ice finally melts. Part of that organizational process includes rigging boats that are ideally suited to fishing early in the year and at times actually among the floating icebergs! For the past couple of years I’ve been taking an early spring trip to Lake Nipigon in Northwestern Ontario to target the coveted brook trout. The Lake Nipigon fishery is perhaps the best “drive to” destination in North America. Being able to drive to Nipigon and trailer my own boat, motor and trailer affords me the unique opportunity to fish a wilderness experience with all the boating and marine creature comforts. The Starcraft Freedom 18 is my boat of choice for fishing wilderness waters and other destinations in the early spring. Designed as a utility boat suitable for a wide variety of fishing and even hunting situations, the Freedom 18 is big enough to be sea worthy on large waters like Nipigon, but small enough to launch at marginal public access sites. The Freedom series is also available in a smaller 16 foot model. One of the features I like most about the Freedom is this boat series is offered in both a side console and tiller version. My personal boat is a tiller equipped with a 75 HP Evinrude E-Tec which kept the overall cost of the rig modest and allows me the maximum amount of “fishable” space inside the boat. Even this modest engine pushes the Freedom 18 about 33 MPH with a full load of fuel and three guys on board! For the angler who wants a faster boat or a boat with more power to move heavy loads of gear, the Freedom 18 SC version accepts up to a 115 HP outboard. The Freedom 18 is actually just under 19’ in length and a whopping 88 inches wide making it ideal for fishing big and small waters. To effectively target ice out species a fishing boat needs to be equipped with some essential fishing accessories including an electric motor and good electronics. My choice in electric motors are the “auto-pilot” style motors that can programmed to operate in continuous mode to follow a compass heading or used like a traditional electric motor for alternate on and off operation. Often in the early spring the best fishing is in shallow water along the shorelines that warm a little quicker than the main body of the lake and in turn attract baitfish. Slipping silently along the shore line with an electric motor while casting ahead of the boat is one of the best ways to target fish.Sonar is also an important accessory and my choice is a combination sonar/GPS unit such as the Lowrance HDS series products. I typically split the screen and monitor both sonar readings and the GPS Mapping page at the same time. This provides me confidence to navigate in unfamiliar waters and avoid sunken islands, reefs, rock piles and other navigation hazards. Ice out is a magical time among fishermen who understand that the first open water of the year is a gift waiting to be enjoyed. The fact that fish tend to concentrate in shallow water at this time of year, makes it easier to find and catch fish. 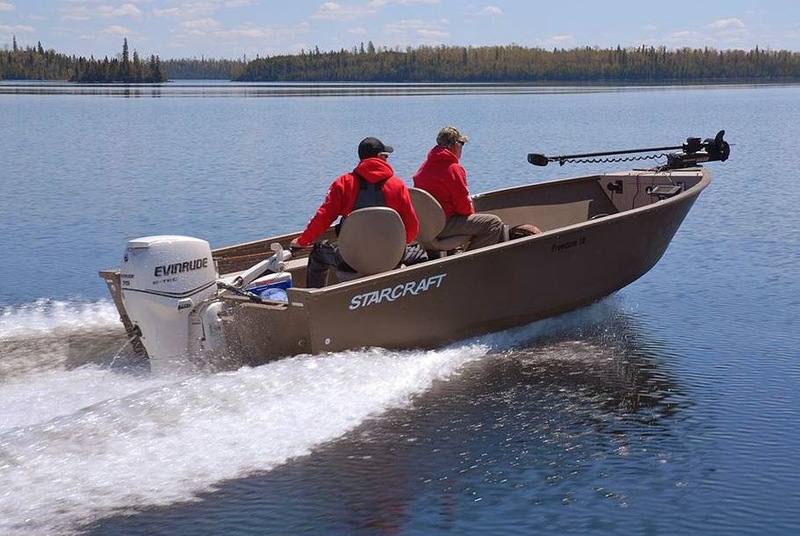 Utility boats like the Starcraft Freedom series are ideal for this style of fishing. Anytime an affordable and spacious boat is called for, I find myself backing up to the Starcraft Freedom and heading for my favorite fishing haunts. For more information on the Freedom and other Starcraft boat models visit, www.starcraftmarine.com or visit your local Starcraft dealer.